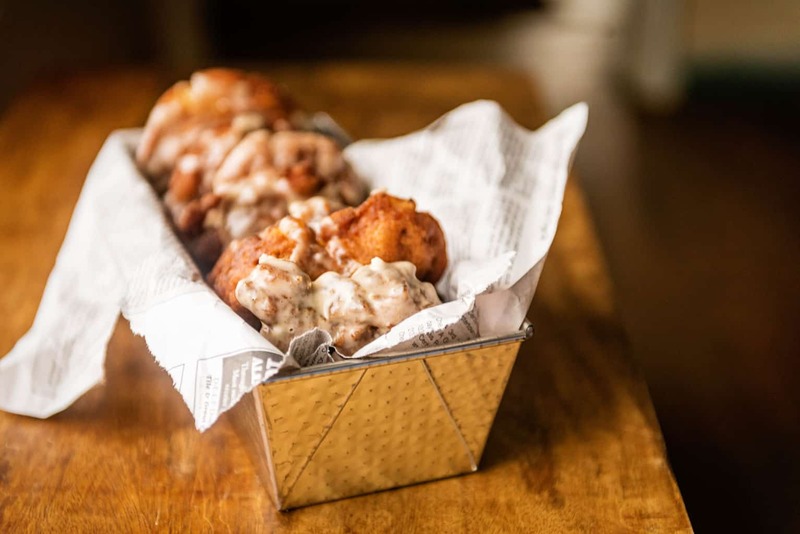 The best mornings start with fresh warm apple fritters. They take your doughnut game up a level and this recipe makes perfect fritters every time! There is something about a fritter that I can’t resist. The problem is, fritters are often pockets of soggy dough and lack a crisp flavor. 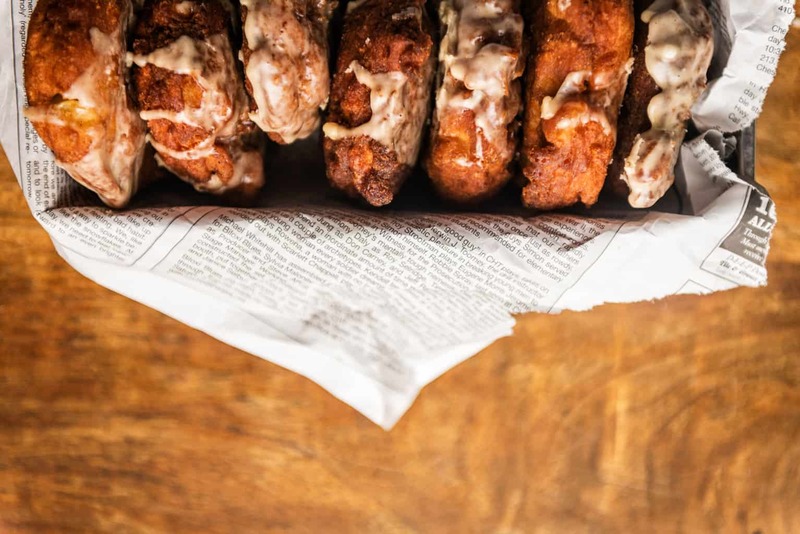 But when done right, an apple fritter is about the most grab-and-go baked breakfast snack on the planet. 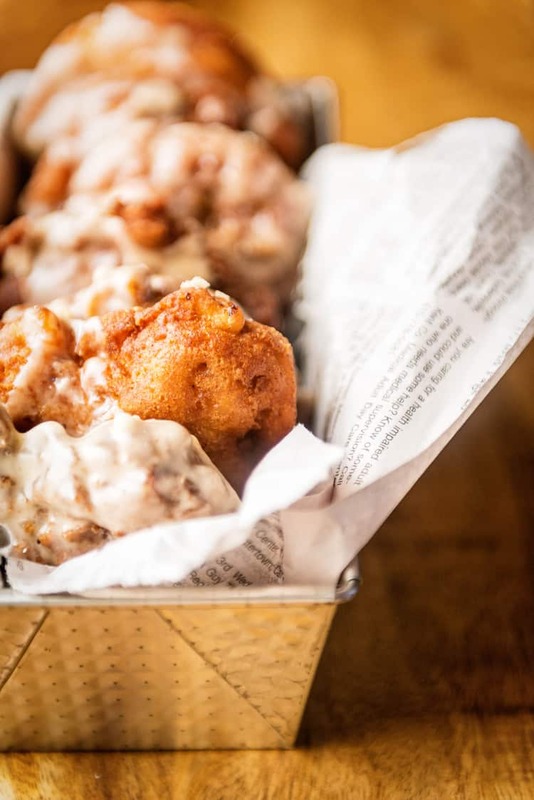 Why are perfect apple fritters so hard to come by? Good apple fritters have to be made fresh and enjoyed quickly. Right now quickly. They are truly a fried dough food and their bumpy fruit filled texture makes dimples for oil to pool, even if you have drained them well. To limit this, I flip my fritters while letting them cool, trying to minimize the leftover oil and make the fresh crisp outer layer last a little longer. With that in mind, unless I am at a real deal bakery, I don’t order apple fritters. Ones that have been sitting on racks all morning soaking in their own grease just aren’t as good. 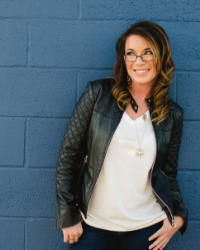 To avoid disappointment, I stick with the powdered sugar classics and avoid the doughnuts all together (ok, that’s a lie, I play the adult card and try to stick with a healthy breakfast protein option because…. calories… whomp whomp, but sometimes I give in and have a doughnut hole). The best apple fritters are made with crisp apples for the flavor. The best apple fritters have a bold crunch with crisp seasonal apples. This recipe uses tart granny smith, but use any tart firm apple your family loves. However, slightly past ripe apples are good to use up in recipes like this, where over time the fried dough will soften their texture. Just make sure that the apples aren’t too far gone or they will be soggy in the mix and the end result won’t be nearly as good as you want. (Have soggy apples, make slow cooker applesauce – or check out all the fall baking ideas in the recipe archives!). 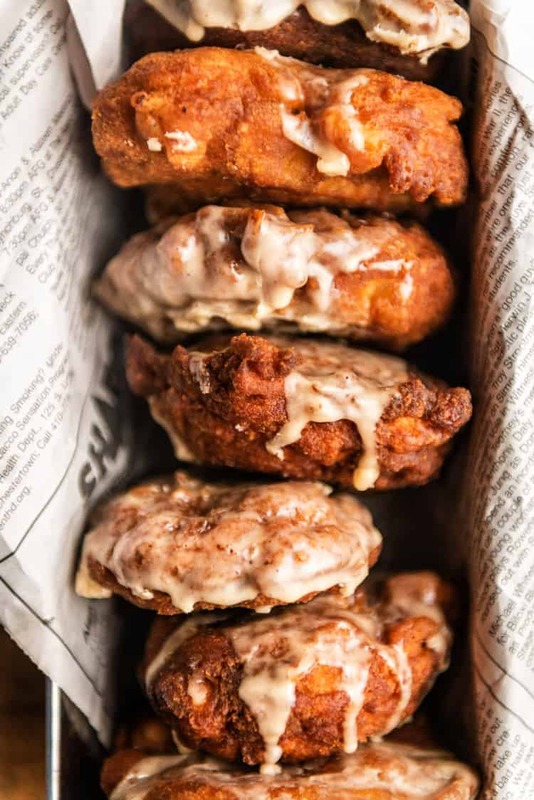 Lastly, bump up the apple fritter flavor with pressed or condensed ciders. Use a top quality cider, one that looks murky to the naked eye, with real ingredients and not an inexpensive watered down juice. The more pure apple flavor you can infuse from the start, the better the final product will taste. All in all, make apple fritters at least a few time during apple season, glaze them, toss them in powdered sugar, or take them plain. With that first crisp warm bite of a perfect apple fritter, all other doughnuts may forever be lost on you. Looking for more crispy breakfast confections? These are sure to be a hit at the breakfast table! If you’ve tried this Apple Fritter recipe or any other recipe on passthesushi.com please don’t forget to rate the recipe and let me know where you found it in the comments below, I love hearing from you! You can also follow along for more good eats and travel tips on Instagram @passthesushi & @girlcarnivore, Twitter & Facebook. Line a flat work area with paper towels or clean kitchen cloths. Line a baking sheet with a wire rack and set aside. Heat the oil in a heavy bottomed high walled Dutch Oven or similar pot over medium-high heat, leaving at least 1" from the rim of the pan to the surface of the oil for safety. Heat the oil to around 350 degrees (use a candy thermometer for temping the oil). For the fritters, peel , nd core the apples then dice them into 1/4" pieces. Arrange the diced apples on a lean single layer baking sheet and pat dry with paper towels. Working quickly, so the apples don't brown, whisk the flour, sugar, baking powder, salt, cinnamon and nutmeg together in a large bowl. Toss the apples into the flour mixture to coat. In another bowl, which the apple cider, eggs and butter together to combine. Pour the cider mix into the flour mixture and stir with a wooden spoon until combined. Working in batches, scoop about 1/3 cup batter into the hot oil and fry for 2 to 3 minutes per side, making sure the oil doesn't cool too much between batches. Remove the fritters with a slotted metal spoon, draining access oil back into the pot. Place the fritters on the wire rack to cool, at least 5 minutes. Continue for the remaining batter. To make the glaze, whisk the confectioners' sugar, cider cinnamon and nutmeg together in a bowl. When ready, spoon a heaping tablespoon over the warm fritters and allow to set 10 minutes before serving. You consistently nail it with every recipe. I can’t wait to get some apples for this.